This famously wild and scenic river is one of Oregon's top destinations for outdoor adventures. 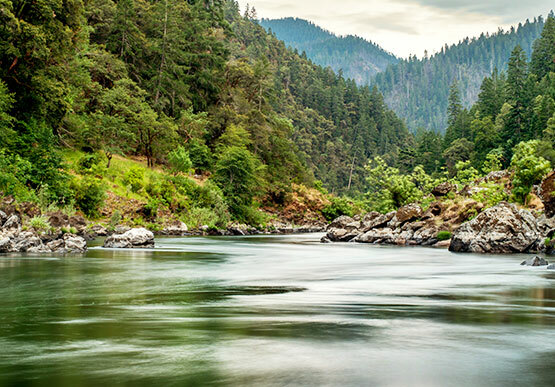 The Rogue River flows about 215 miles westward from the Cascade Range to the Pacific Ocean as is renowned for its salmon runs, whitewater rafting, and rugged scenery. Take a wild ride on a high-speed jet boat from the famous Jerry's Rogue Jets. Sail across the Rogue and admire the scenery and wildlife including black bear, river otters, eagles, and the rare mountain lion. Embark on a rafting or kayaking trip and gaze at the steep canyons, gentle meadows, amazing rock formations, old growth forests in every direction. The Rogue River is also an ideal fishing destination where you'll find champion-size Chinook and king salmon, and steelhead. After all of the fun on the river, head into town to experience the many craft beer breweries, wine tasting rooms, and laid-back eateries. Are there rafting trips on the Rogue River? Yes, the Rogue River is one of America’s top whitewater rafting and kayaking destinations. Whether you are a first-timer or an expert rafter, there's a trip for everyone. Trips range from four hours to four days and can be combined with hiking, fishing, and swimming excursions. Where is the best fishing on the Rogue River?